It’s time to make balance training a priority. Last month’s move focused on rotation. This month, we’re going to look at something many of us take for granted: balance. Most of us know balance skills diminish with age, yet often neglect to train it until it becomes a problem. Since preventing against future injuries and strengthening existing skills is always our goal, this article introduces the concept of dynamic balance training, as well as our version of the star balance exercise. Let’s first talk about balance’s technical points and then explore dynamic balance training’s purpose. From an anatomical perspective, keeping you stable requires your body’s sense of vision, auditory system (specifically, your inner ear), and touch. 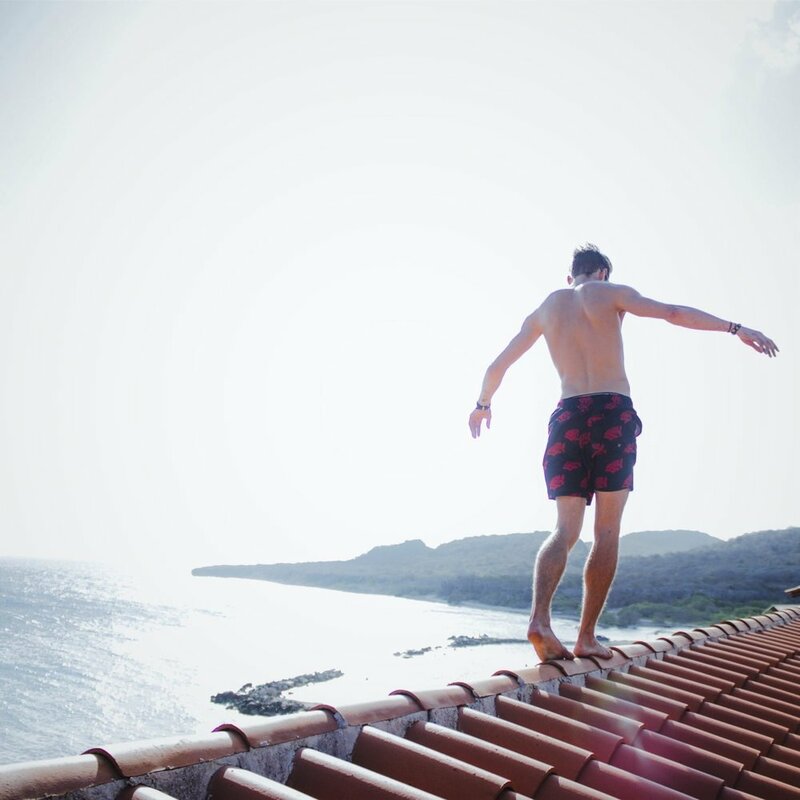 All three senses receive constant environmental sensory stimulation, telling your brain where and how to move your limbs so you reduce your fall risk. Traditional balance exercises for seniors, athletes, and rehab patients focus on balance’s two types: static and dynamic. Static balance is your body’s ability to maintain its positioning while remaining still (like standing upright). Dynamic balance is what you use throughout your day. It’s your ability to remain in motion while you make subtle or sudden postural changes. Both static and dynamic balance rely on your body’s center of gravity (CoG); that is, the most concentrated point in your body where all your weight is located. It’s from your CoG that the earth’s gravitational pull holds you down, even if you’re leaping horizontally or diving off a platform. We live in a multitasking world. Training dynamic balance ensures you’re not thinking twice about staying upright while at work and play. Balance is one of your body’s “use it or lose it” abilities. The more you train it, the less like you’ll be to have future issues, like lower limb injuries. 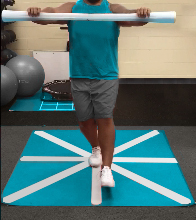 If you’re an athlete performing sudden directional changes, a few minutes of daily dynamic balance training is like insurance against injuries and accidents. Balance training improves flexibility and reflex response times. What we’ve described is called coordination fitness; or, how your body integrates multiple skills as you perform activities of daily living (without falling over). Since balance impacts everything you do, training it allows you to take better control over your body’s natural aging process, helping you move beautifully through all life stages. Star balance is used by therapists and trainers as both a test of dynamic balance skills and as a standalone maintenance exercise. We encourage you to use the sensory star balance movement in the same way or work it into your warm-ups or cool-downs. As you can see from the photo, the pros used tape to guide exact positioning. This isn’t at all necessary for you to do at home. If your proprioception is healthy, mentally map out the star position to be sure you’re reaching in the correct direction. Here’s an important heads-up before you get moving: The sensory star balance exercise challenges your visual and vestibular systems, along with stability and posture. Because this exercise entails quick movements with the head and neck, please be mindful of your own limits and your body’s needs. If you are unsure if this exercise is of benefit or suitable for you, please consult with us and/or your clinician. We’ve given three different starting points for this exercise, based on your individual experience. Always follow what is right for you! If you consider yourself a real balance pro or want to add an additional challenge at any level, do not let your extending foot touch the ground as you move through the exercise. One of our mindful movers demonstrates in a short video and we’ve broken out the moves step-by-step with screenshots to guide you. Are you ready? Take off your shoes, grab your WAV, and let’s move! Prepare for balancing on your left foot. Stand with your feet together at the center of the star and arms down. Hold the WAV with an overhand grip, shoulder width apart (use smooth bands to guide even hand placement). Slightly bend your right elbow to tip the WAV to the left without shifting your hips or spine. Reach out in front of you to shoulder height, keeping the WAV parallel to the floor. Preparing to move in a natural standing position. Am I maintaining a neutral spine and relaxed shoulders? Do I feel the added weight in my left foot? Only her leg has extended and the mindful mover hasn’t shifted her head or torso. Bend your left knee and extend your right leg out to your left and touch your big toe on the floor. Bend your left knee and extend your right leg to the front left on a diagonal and touch your big toe on the floor. Bend your left knee and extend your right leg straight out in front and touch your big toe on the floor. Challenging your balance with an altered based of support. Am I keeping good posture and only changing position with my lower body? Her vestibular system is challenged in this dynamic balance exercise. Tilt your head towards your right shoulder and return to upright. Repeat 1x. Tilt your head towards your left shoulder and return to upright. Repeat 1x. Step your right foot back to center, rest both feet on the floor. Lower the WAV. Dynamically challenging your balance and postural stability. Am I breathing throughout the movement? Are my shoulders relaxed and the WAV calm and even? Am I giving myself enough time in between movements to feel a “reset” and feel steady with a quiet WAV prior to shifting again? She is dynamically challenging her balance with her leg in the anterior and posterior positions. Bend your left knee and extend your right leg to the back left on a diagonal and touch your big toe on the floor. Bend your left knee and extend your right leg straight back and touch your big toe on the floor. 1. Switch sides. Repeat Steps 1 through 4 bending the right knee and extending the left leg. Was that challenging? How many times did you become unsteady? Don’t worry, we won’t tell! You can repeat this move as often as you’d like, but we can’t emphasize how much dynamic balance training can and should be performed on a regular basis. The star balance exercise is a perfect low-intensity recovery exercise between sets of high-intensity interval training. You can even use dynamic balance exercises as low-intensity bodyweight workouts the day after a tough training session or workout--it’s a great recovery move. Now that we’ve got you steady on your feet, are you ready to move forward? For more tips on balancing beautifully, join our growing Mindful Movers community over at Facebook and Twitter. Dynamic balance research is growing in popularity. While we’re excited to share our take on it, here are a few extra resources for those with a mind for movement.